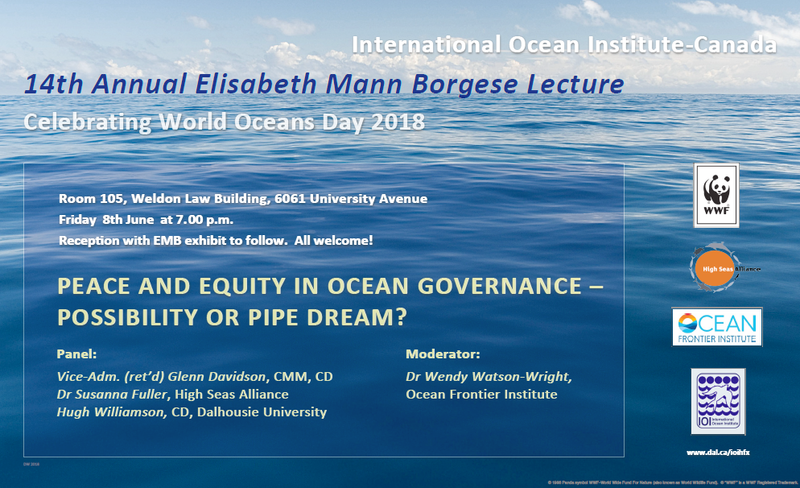 The Elisabeth Mann Borgese Ocean Lecture Series commemorates and celebrates the life and work of Elisabeth Mann Borgese, founder of the International Ocean Institute. Launched in 2005 to mark the 25th anniversary of the IOI Training Programme in Halifax, it aims to encourage the debate on oceans issues which was so dear to Elisabeth, by inviting internationally renowned speakers to discuss important and timely ocean-related topics. Through this lecture series, we hope to generate awareness among stakeholders, academics, students and the general public about important ocean issues. Moderator: Dr Wendy Watson Wright, Chief Executive Officer, Ocean Frontier Institute. A reception followed with the first opportunity to view the EMB centenary exhibit. IOI-Canada would like to thank the High Seas Alliance and WWF-Canada for their generous financial support of this event. For further information: contact ioi@dal.ca or 902 494 6918. 2017: panel discussion on Marine Protected Areas - For Whom? incuding live streaming from New York, where the first UN Oceans Conference was taking place. The panel at Dalhousie consisted of: Moderator: Sean Brillant, Manager – Marine Programmes, Canadian Wildlife Federation; Maxine Westhead, Section Head, Protected Areas and Conservation Planning, Oceans and Coastal Management Division, Department of Fisheries and Oceans; Ken Paul, Director of Fisheries, Atlantic Policy Congress of First Nations Chiefs Secretariat; Paul Barnes, Director – Atlantic Canada & Arctic, Canadian Association of Petroleum Producers; Veronika Brzeski, Executive Director, Cape Breton Fish Harvesters Association. 2016: panel discussion on CLIMATE CHANGE IN NOVA SCOTIA: ARE WE READY? with Richard Zurawski(Chair), meteorologist, radio host and author; Blair Greenan, Research Scientist & Head, Oceanography and Climate Section, Department of Fisheries & Oceans (click here to download presentation); Shannon Miedema, Manager, Energy & Environment, Halifax Regional Municipality (click here to download presentation);Tim Webster, Research Scientist, Applied Geomatics Research Group, Nova Scotia Community College; and, Georgia Klein, Lecturer, College of Sustainability, Dalhousie University. 2015: panel discussion on THE OCEAN AND YOU: WHY DOES IT MATTER? featuring: Douglas Wallace (Chair), Scientific Director, Marine Environmental Observation Prediction & Response Network; Kumiko Azetsu-Scott, Research Scientist, Oceanography & Climate Section, Department of Fisheries & Oceans; Heather Kelday, Executive Director, Nova Scotia Sea School; Bud Streeter, President, Lloyd's Register Canada Ltd; and, Boris Worm, Professor, Department of Biology, Dalhousie University. 2014: Dr Susan D. Shaw, President& Founder, Marine Environmental Research Institute, Blue Hill, Maine and Professor, School of Public Health, Environmental Health Sciences, State University of New York, Albany. Dr Shaw spoke on Reckless Endangerment: The Gulf Oil Spill Revisited -- And Why Canada Should Pay Attention. For a copy of her speech, please e-mail IOI-Canada. 2013: Nikolaus Gelpke, President of the Ocean Science Research Foundation, Vice-President of IOI, founder & Editor-in-Chief of the award-winning mare, publisher of mareverlag, and Managing Director of maribus gGmbH. A video of his lecture on Communicating the Oceans is available by e-mailing IOI-Canada. 2012: In the run-up to the UN Conference on Sustainable Development, a panel session on Blue Planet under Threat: Challenges and Opportunities at RIO+20 featured Dr Awni Behnam, President, International Ocean Institute, Dr Susanna Fuller, Marine Conservation Co-ordinator, Ecology Action Centre, Ms Megan Leslie, MP for Halifax, Deputy Leader and Environment Critic, NDP, and Hon. David MacDonald, Commons Group, and was chaired by Dr Larry Hildebrand (Senior Research Fellow, IOI-Canada). Dr Hildebrand's introductory presentation (990 KB) can be downloaded, and an MP4 video (3.4 GB) of the event is available upon request, by e-mailing IOI-Canada. 2011: CBC's Paul Kennedy hosted Arts and the Sea: a Celebration, a multimedia evening of ocean-focused conversation, music, literature, painting and photography. He was joined by Dusan Kadlec (painter), Kathy Mac (poet), Scott Macmillan (composer) with Jennyfer Brickenden (librettist), and Donna Morrissey (author), with images on display by Damian Lidgard (photographer). 2010: Dr Susan Lieberman, Director, International Policy, the Pew Environment Group, Washington, USA, lecturing on Science versus Politics: Tales from CITES. For the full written text of her lecture, click here. To listen to the evening's proceedings, with welcome from Mr Michael Butler, introductory remarks by Dr Gilbert Winham, the keynote address itself, and a questions session moderated by Dr Ratana Chuenpagdee, please contact IOI-Canada for the 84.5 MB mp3 file. 2009: Dr Rob Huebert, Associate Professor in the Department of Political Science at the University of Calgary and Associate Director of its Centre for Military and Strategic Studies, Calgary, Canada, lecturing on Canada and the Circumpolar World: The Coming Blizzard. A full abstract is available here. 2008: Dr Elliott Norse,President, Marine Conservation Biology Institute, Bellevue, Washington, USA, lecturing on Oceans of Hope: Encouraging Signs in Marine Conservation. A 13.1 MB pdf version of the presentation is available upon request, and the text of Dr Tony Charles's introductory comments can be downloaded. 2005: Dr Andrew A. Rosenberg, Commissioner, U.S. Commission on Ocean Policy, and Professor, Natural Resources Policy and Management, University of New Hampshire, USA lecturing on Ecosystem-based Management of Ocean and Coastal Resources: Can We Get There from Here? Introductory comments to this inaugural lecture of the series, delivered by the President of IOI, Dr Awni Behnam, can be downloaded here.